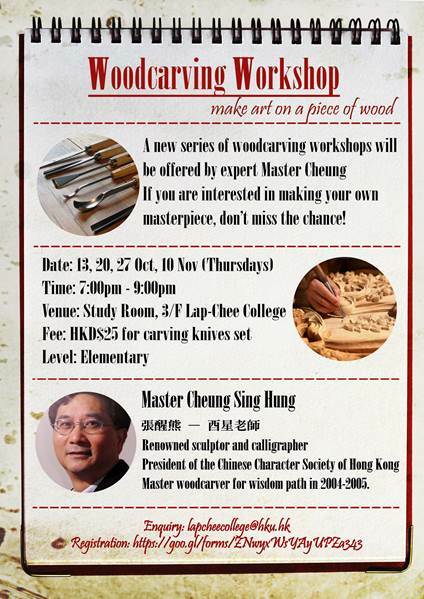 A new series of woodcarving workshops will be offered by expert Master Cheung (酉星老師) in this semester. He will teach students how to make art on a piece of wood. If you are interested in making your own masterpiece, don’t miss the chance to join the workshops! You will be taught to make two to three artpieces in four classes. Those who have joined Master Cheung’s class last academic year may wait until his advanced class to be held in second semester. A renowned sculptor and calligrapher who has won numerous prizes in woodcarving and calligraphy. President of the Chinese Character Society of Hong Kong. Master woodcarver for wisdom path in 2004-2005. Students who register the workshops may join the tour to Master Cheung’s private workshop in Kennedy Town on Saturday, 29 October 2016.